Why do they come up on the radar? Do they have a transponder? What is the purpose of these vehicles? They have Mode-S transponders / ADS-B transmitters specifically for vehicles such a the ERA SQUID, Thales MOSQUITO or Saab Sensis VeeLoPDF. Typically vehicles that operate on taxiways and runways are equipped with such transponders, which ensures the vehicles can be tracked by the Advanced Surface Movement Guidance and Control System (A-SMGCS). Vehicles that only operate near parked aircraft are usually not equipped. When using a magnetic mount, these transponders can be easily transferred between cars. This reduces the total number of transponders needed, but makes it necessary to reprogram the call sign after each transfer. 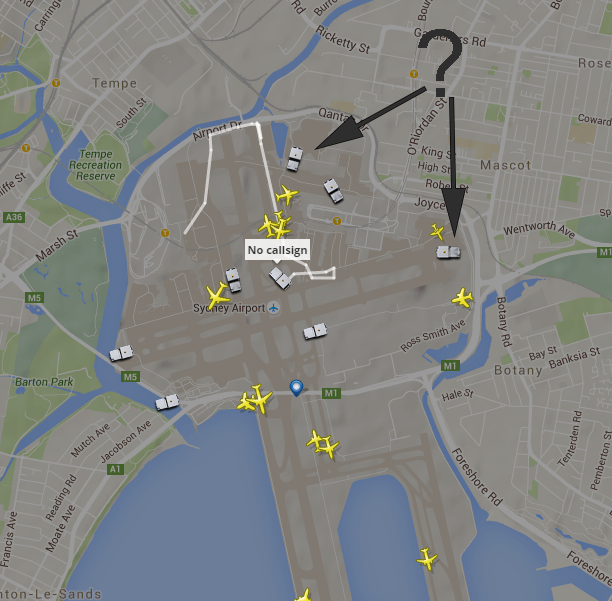 For this reason it may have been decided to have no call sign in the transponder at all for these vehicles at Sydney airport. An example of an airport using fixed installations with call signs is Amsterdam airport. Using FR24 you can see bird control, maintenance, supervisors, tugs, fire trucks etc. driving at the airport and sometimes, when they forget to turn the system off, on the highway. After some further investigation, I am fairly sure they use the Saab Sensis VeeLo in Sydney. The units are magnetically mounted to the vehicles. Each unit transmits using a fixed unique 24-bit address (like all Mode-S transponders / ADS-B tranmitters) and no call sign. In the A-SMGCS software the 24-bit address is mapped to a call sign which is displayed on the Controller Working Position. There is procedure in place to ensure that when a vehicle is entering the manoeuvring area the correct mapping between the 24 bit address and the call sign is in the A-SMGCS system. On this question it is mentioned that ground support vehicles are equipped with ground transponders that work with the airport ground radar. I doubt they have ADS-B. They are most likely getting a feed from the ground radar system. In this thread on the Flightradar24 forum they discuss what types of ground systems are compatible with the FR24 recievers. One of them mentions that the feed can apparently be switched off by the controllers. Not the answer you're looking for? Browse other questions tagged airport ads-b flightradar24 or ask your own question. Is there any System to warn of Runway Incusion? Is ADS-B intended to replace other traffic management systems? What do the radiation patterns of ADS-B transmissions on large airliners tend to look like? Is there a way to find what types of aircraft have landed at an airport?